Teddy Bear Toss 2017 at the Vancouver Giants vs. Prince George Cougars Hockey Game — . Last night was the annual Teddy Bear Toss. 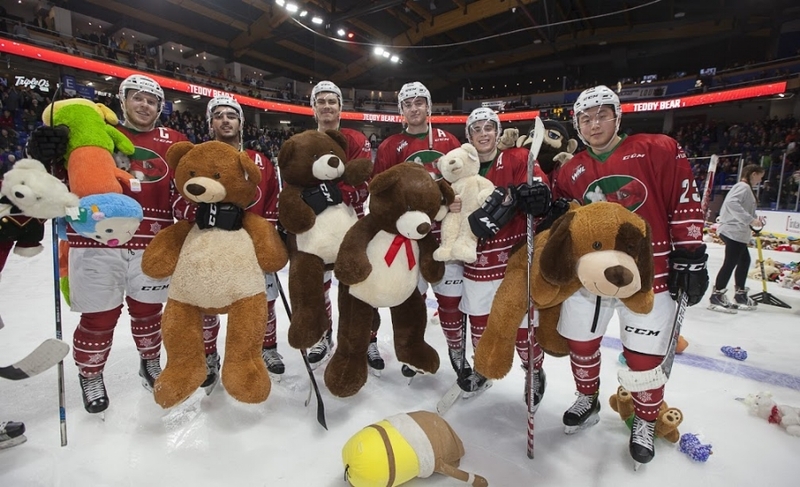 Fans were asked to bring stuffed toys with them to the Vancouver Giants vs. Prince George Cougars game. The rain of teddy bears began when the Giants scored their first goal. All the stuffed toys collected were donated to the Lower Mainland Christmas Bureau to be given to children in need. We thank the Vancouver Giants for organizing this event and the fans for their support. Thank you to The Gourmet Warehouse and Continental Importers Ltd. for donating the use of their trucks so that we were able to transport the piles of plushy toys back to our warehouse. Our warehouse and boardroom are now filled and we look forward to finding a happy home for them. Check out some of the highlights in the video below.